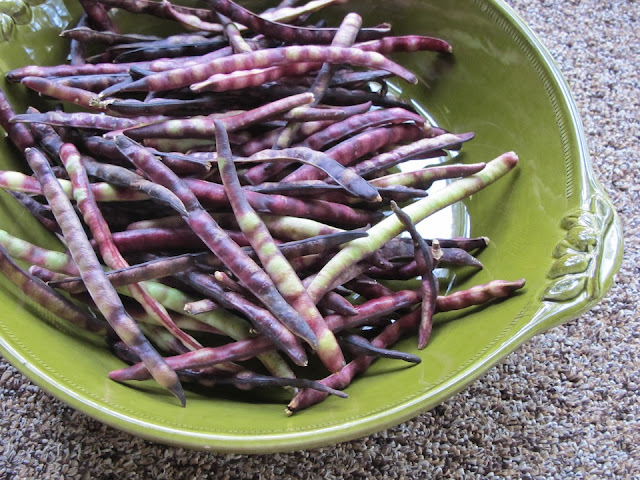 To me, purple hull peas are as southern as sweet tea. You can’t live in the south and not eat these gems in the summer. And right now is purple hull pea season! If you have a few kids to entertain during these last few days of summer break, pick up some unshelled peas at your local farmers market and get them to shellin’. Otherwise, you can probably find them already shelled, I did. The peas are a cousin to black eyed peas, and named for their purple shell. The secret to making them delicious is to keep them from getting mushy. Debbie at Dining with Debbie suggested cooking them in the slow cooker, and it worked like a charm! They were soft, but firm enough to keep from getting mushy. I served them with rice, but cornbread would be great, too. Cook peas on low for 6-8 hours. Remove onion, and serve with rice or cornbread. Copyright © 2012 Our Everyday Dinners - This is an easy recipe for how to make Slow Cooker Purple Hull Peas.